Lately, I have been creating with images from Iralamija Shop. I love these vintage Easter images. 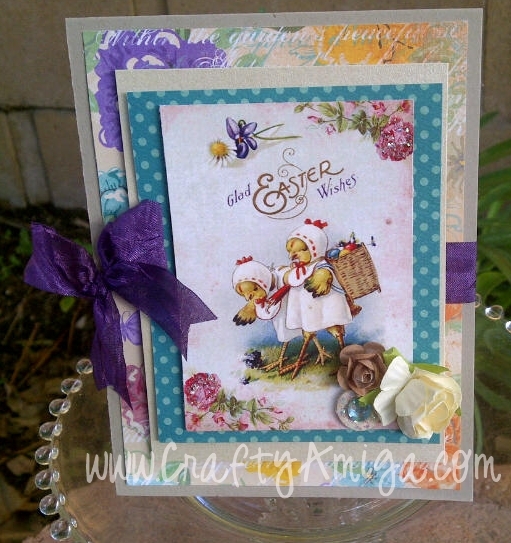 The top card was made using some of the new Bo Bunny Ambrosia line. I love the rich colors. This card was one that was out of my norm. I usually never use purple in my card making! I hope you like it! This second card was a quick card I came up with. 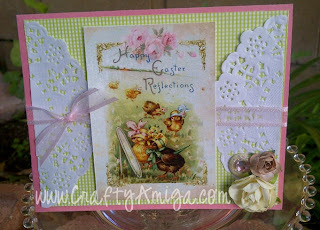 For the background I used Memory Box Co gingham patterned paper and an image from the Easter Chick Collage sheet from Iralamija. I am going to be participating in a Craft Fair Fundraiser this weekend (03/24/2012) and I am hoping to sell a lot of my Easter cards. If you're local to the Inland Empire, maybe you could make it out to check out the fair. There is going to be approximately 200 vendors! Click here for the Craft Fair flyer.